Sometimes God showers blessings as a double dhamaka offer. All thanks to the Almighty that my desire to address more and more people came true as my craving for it grew stronger day by day. 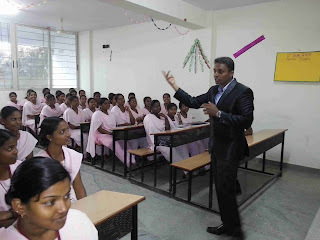 It was just couple of days back when I was invited to Sri Laksmi Group of Institutions to address the nursing students, some of who were pursuing their diploma in nursing and some were from B.Sc (nursing). There was a batch of students who were in their masters as well. 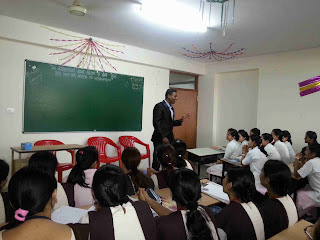 Two sessions back to back were planned for one hour each and students from different classes were combined in one classroom and that's where the dreams party began. 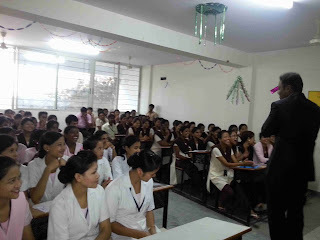 The first session started around 11am and there were more than 80 students in the class, many were from north-eastern part of India. Kunal Taswalaji took up the introduction to introduce me for the first ever time. I was invited with a thunderous applause as I embarked upon the stage. I spoke about how I being from engineering and them being from nursing background didn't have anything common to talk about. Then I took them back in their memories of childhood and reminded them that they too had dreams like me to become highly successful in life. After that, we spoke about how fears have stopped us from even accepting our own dreams. Lack of self-confidence and scarcity of appreciation have ruined our self-respect and self-image. I addressed about these issues and shared my mantra with them. The mantra was 'BREAK YOUR FEAR AND LOVE YOURSELF'. The same topics were touched in a different style during the second session that started by 12:15pm. I was shocked to see students saying that their dreams have become smaller as they grew more. That's where I reminded them that dreams seemed to be smaller because they had pushed them away and taught the same lesson as mentioned above. 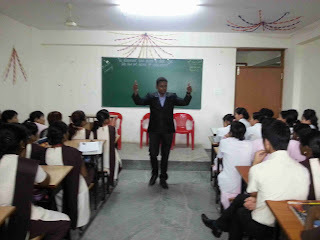 The one hour sessions were elongated to 90 minutes each because students were enjoying the sessions. Both the sessions were highly humourous and students laughed their heart out. Yet, the impact was tremendous. When I called up the principal, Smt. Bhagyalakshmi mam, I got to know that one of her students who was running around with a document from one week to quit her nursing, after the session went to her principal and committed that she would never quit but would stay back and complete her education. I was very glad to hear this feedback along with reading pages of feedback that the students had written. Over all, it was an amazing experience to address students from completely different stream and background from that of me but still be able to trigger the passion for dreams and break the fears in them. I would like to thank the principal mam for providing us the opportunity. I would like to congratulate Mr. Arun Chikmarappa, competing for Your Big Year competition 2013 because of whom close to 200 students were made aware about global platforms like World MERIT and Your Big Year. Last but not the least, I must thank my team IU(Inspiration Unlimited) and my mentors, Lalwani brothers for their amazing support and mentoring.